Pictured from left, are Charles Morrison, superintendent for the District’s McMinnville office; Jerry Cooper, former state senator; Michael Torrence, Motlow president; Larry Flatt, Motlow executive director of Advanced Robotics; and Mike Corley, the District’s vice president - human resources and general counsel. 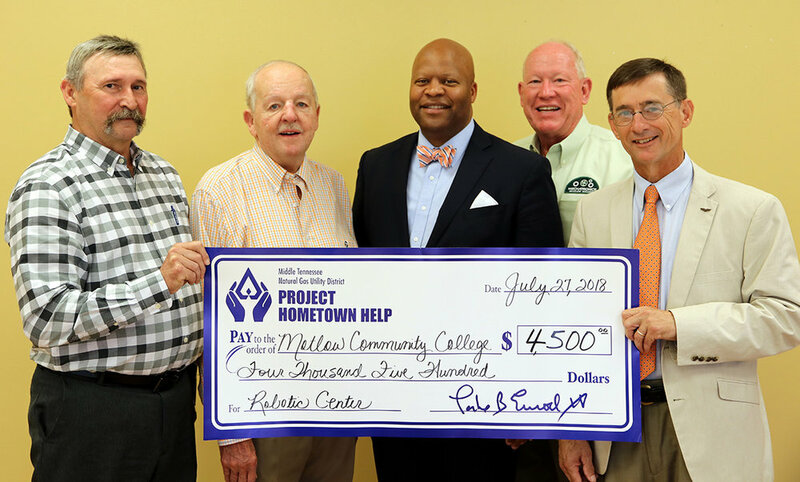 Motlow State Community College recently received a $4,500 donation from customers of the Middle Tennessee Natural Gas Utility District through the District’s “Project Hometown Help.” The donation is for the Automation and Robotics Training Center that is under construction at the Motlow McMinnville campus. Funds from the Hometown Help voluntary program, which come from an automatic rounding up of participating customers’ bills to the next highest whole dollar amount, are used to advance education, assist economic development, promote local charities and provide relief to the disabled and elderly for payment of natural gas bills.